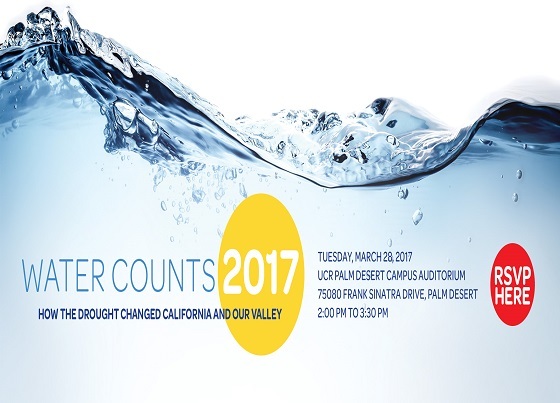 (Palm Desert, Calif.) On Tuesday, March 28, CV Water Counts (CVWaterCounts.com), in conjunction with UCR-Palm Desert and the Coachella Valley Economic Partnership (CVEP), will host Water Counts 2017: How the Drought Changed California and Our Valley. * Erik Ekdahl of the California State Water Resources Control Board, who will provide an update on extending the emergency drought regulation and long-term conservation policies under consideration. * Kathleen Tiegs of the Association of California Water Agencies (ACWA), who will discuss how water agencies across the state were impacted by the drought and regulations, and how they are planning for the next drought. * Michelle Sneed on behalf of the U.S. Geological Survey, who will give an overview of the Coachella Valley’s aquifer characteristics, conditions and trends. CV Water Counts will also make an announcement about a new program that will be available to community, business and civic leaders. The event takes place on Tuesday, March 28 from 2:00 – 3:30 p.m. at the UCR Palm Desert campus Auditorium, 75080 Frank Sinatra Drive, Palm Desert. There is no charge to attend, but seating is limited. Attendees can register by visiting CVWaterCounts.com/rsvp. CV Water Counts is a non-profit collaborative that was formed to focus on water conservation, through awareness and education to Coachella Valley residents, businesses and government. It is comprised of the Coachella Valley’s five public water agencies: City of Coachella/Coachella Water Authority (CWA), Coachella Valley Water District (CVWD), Desert Water Agency (DWA), City of Indio/Indio Water Authority (IWA) and Mission Springs Water District (MSWD). For more information, visit CVWaterCounts.com.